← New Forest: C19th daring marauder or domestic cottager? The smell of good meadow hay is one of the best aromas of the countryside. This week has been one of hectic hay making activity. 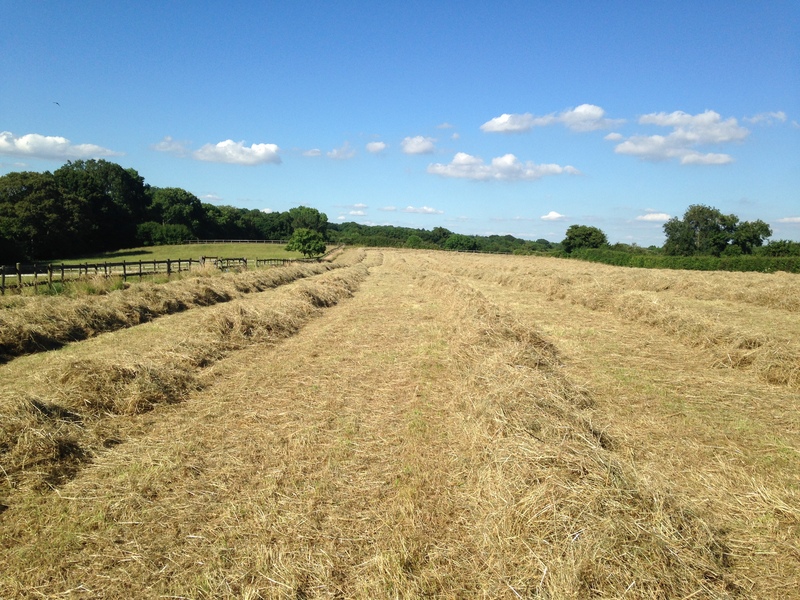 The hay was cut on Friday morning last week and tedded (spread for drying) several times during the weekend and rowed-up ready for baling during Monday morning. The smell from freshly tedded hay has got to be one of the most delicious aromas that the countryside has to offer. It has a sweet bouquet, filled with more fragrance than just the smell of cut grass one would get from a lawn. Hay contains a variety of meadow grasses, such as Timothy (Phleum pratense), Common Bent (Agrostis capillaris), Crested Dog’s-tail (Cynosurus cristatus), and Sweet Vernal-grass (Anthoxanthum odoratum), which perfume the air when walking the field between the rows. During one of my inspections I found a field vole’s nest that had been thrown down with the hay and the remains of a mouse that had not escaped the cutters. I suddenly realised why my resident buzzard had been taking such a keen interest in the progress of the haymaking. The fox that lives in a den close to our boundary hedge will also, no doubt, be taking advantage of the situation should any other casualties to be found. By Monday evening the baler was chugging through the field, making the smallholder sized bales that are manageable for one person to lift. As the sun rose on Tuesday (taking the temperatures soaring with it) the shadows cast by its morning glow made the hay bales look like a giant game of dominoes set for play. Now all I had to do was bring it all in! Like most commoners I have a full-time job and so it was later that day, after work, before I could hitch up my trailer to the 4X4 and start the process of bringing in the hay and stacking it in the barn. Thankfully the 35-degree heat of the day had mostly subsided, but it was nevertheless hot, dusty and strenuous work. I finally managed to complete the harvesting – although it did take two days and countless trips. A feeling of smug satisfaction was competing for dominance with my aching muscles, but it was a job well done. The field is now bare and looks enormous. My barn on the other hand seems to have has shrunk in size now that it is filled to the rafters with hay. The small mammals, such as the field voles and mice, which have been accustomed to weaving through the long grasses of the meadow will take a few days to realise that their cover is gone. During this time they will be exposed and vulnerable to predators, such as the buzzard, fox and tawny owl. However, it won’t take long for the grass to grow again and offer them shelter from their foes. Once the meadow has revived livestock can once again be turned out to graze. This field will be the primary grazing for the winter, supplemented of course by good meadow hay. 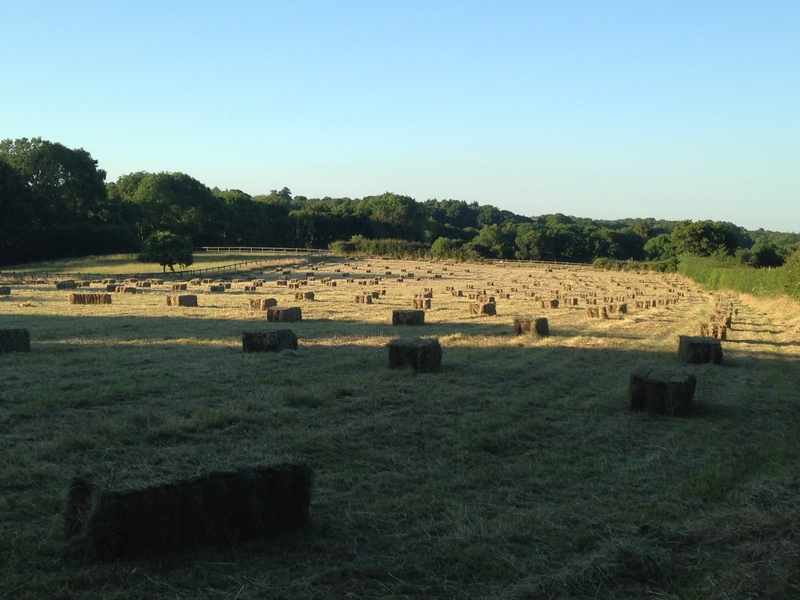 The hay bales are neatly laid out ready for collection – by hand. This entry was posted in New Forest Commoner and tagged Agrostis capillaris, Anthoxanthum odoratum, aroma, bales, Buzzard, Common Bent, countryside, Crested Dog's-tail, Cynosurus cristatus, field mice, fox, grasses, hay, meadow, Phleum pratense, Sweet Vernal-grass, Tawny Owl, Timothy, voles. Bookmark the permalink.